On the very long-term charts, I'm not at all sure - many counts, sloppy, hard to figure, etc. Right now, I do think a case can be made for a completed top of significance on July 24. Could have ended the run up from the February, 2014 low, and possibly even the move from the 2011 or 2009 lows, although such a thing remains to be seen, i.e. that would be a bigger deal, and as of now - who knows? Beyond that, the bull market from the 1970s or 1980s, or even earlier, well, wouldn't that be something? A vigorous launch from the 2009 bottom. Since the 2011 low, a pretty calm and orderly uptrend. So now we have a very clean 5 waves down, and we would be in a counter-trend bounce from the August 7 low. While it's possible to count a five-wave advance from yesterday's low, which conceivably could be "C" of an ABC from the August 7 low, that would give us a comparatively short C wave. Looking at percentage retracements of the move down from the July high, there's certainly a good bit of room overhead, yet. The action from today's high looks like a meandering fourth wave correction, at this point, to me, and in any case I would not be picking tops here, but rather would wait for 5 waves down to confirm a trend change. The market could confound my bearish wave count by going above 1973, which would be more than a .786 retracement of the move down into the August 7 low. It could make a more complex up/sideways correction from the August 7 low, too. Regardless, I think that fairly soon there will come a low-risk shorting opportunity. 5 waves down from the July high, then at some point we think we have a completed correction, whether it's "ABC" or something more complex from the August 7 low. Then, we get 5 little waves down - which presumably would then begin an overall larger decline, equivalent in degree to the decline from the July high, and potentially a third wave in a larger decline. During a corrective move up or sideways after those 5 little waves down, there's a low-risk short, with a stop above the recent high at that point - what we would be calling the end of the rally from the August 7 low. Well, that was fast. Looks like an impulsive decline to me, rather than a correction in the move up from the August low, and our rally from that low can certainly be counted as complete. Short, with a stop above today's high. 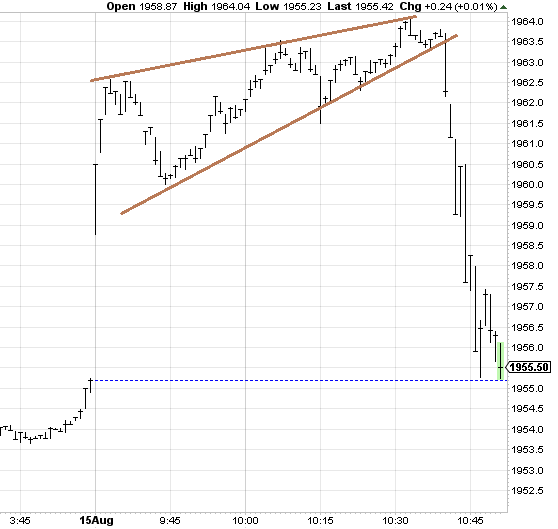 Some really basic chart stuff here, too - a diagonal triangle or rising wedge was forming Friday morning. As I understand it, this pattern is actually one of the less reliable ones. However, we did have a market that was struggling higher at that point, and under a "gap and crap" scenario it would have fit well. I would not blindly sell such things as I've seen them break upwards too. If we are looking for highest-percentage plays among chart patterns then I think things like horizontal flags and pennants (continuation patterns rather than reversal patterns) are much more bankable, and if we want reversal patterns then Head and Shoulders tops and bottoms. Still, I've seen rising wedges be good sells a lot of times, and if we were looking for the end of an Elliott 'ABC' from the August low, then a rising wedge or "diagonal fifth-wave triangle" as wave 5 of C would be no surprise. 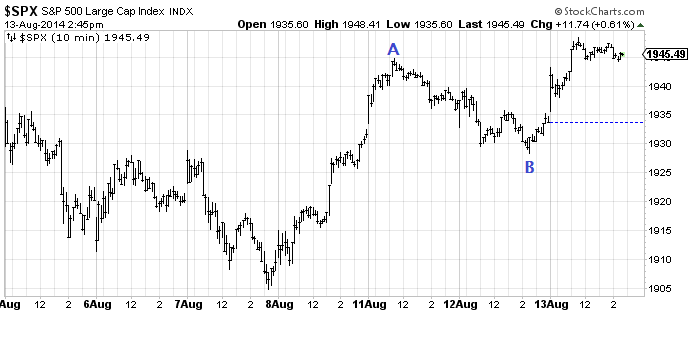 Additionally, after the August 7 low, what would be wave 'A' had a stronger Advance/Decline number on August 8, versus what would be 'C' from the low the afternoon of August 12. This relative weakness is often a tip-off as to the nature of waves. 'C' didn't equal the length of 'A,' either. Admittedly, this is a one-minute chart, and only very quick and nimble traders would be paying attention to such stuff anyway. Going above Friday's S&P high stopped out my short position. The NASDAQ made a new high for the year, so any bear interpretation there would have to be counting a fifth and final wave up in progress, and that's a poor-percentage play, i.e. it smacks of top-picking too much for me. The S&P and the laggard Dow are very close to making me throw in the towel as far as a top of significance in July. the final top is in progress imo. will be this week or next week fwiw. this will be wave 4 in the dow from the 09 low which could take the dow back down to the 13000 area. look at the dow on the monthly chart it filters out all the noise and u will see that we are completing wave 3 here . thats my two cents . look at travelers stock that has a revealing pattern. good trading to you. The decline from the July high sure looks impulsive to me, i.e. five waves and thus it should be a wave 1 or A or C.
So, as of now I don't think it was the beginning of a larger correction. Still possible in the Dow, but the NASDAQ making new highs and the amount of retracement upwards in the S&P makes me think no. 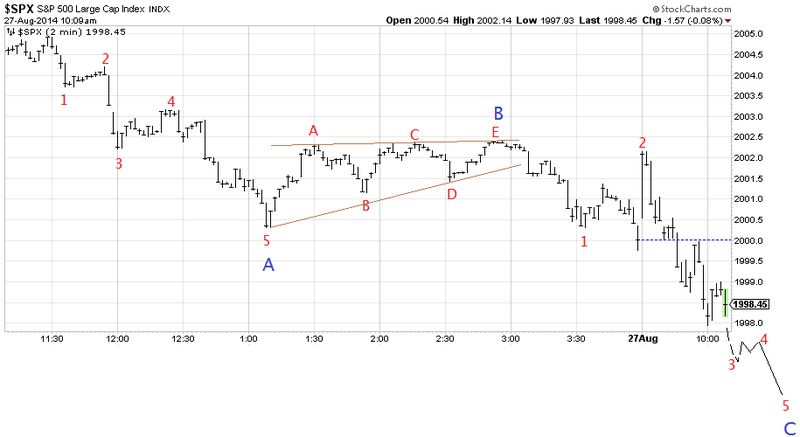 So, I'm left thinking that it really was "too good to be true," and that it was wave C of an "irregular flat correction," ABC as labeled on the chart. "Irregular" came from R.N. Elliott himself, I think, but in practice I believe they are more frequent than the "regular" ones that have the top of wave B the same or lower than the orthodox top (for a correction in an uptrend). 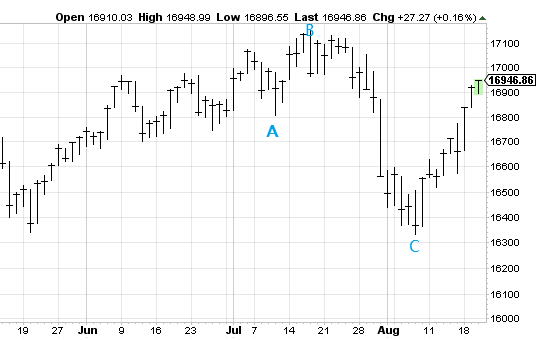 For the Dow, here, the orthodox top prior to the move down to the August low would be July 3. 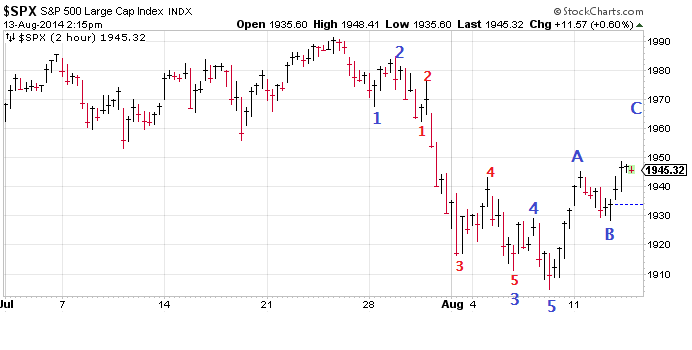 Frankly, I am lost as to a good wave count for the market going up, in all sorts of longer-time frames. May be putting in an ABC down here, short-term. It's also possible to count the whole move down from yesterday's high as complete. Either way, looking at this as a correction in the still-ongoing uptrend from the August low, for now.